The president's criticism of the trade deal clouds an economy shared for years by businesses on both sides. REYNOSA, Mexico — Waving arms and brandishing a long electric prod, the ranch hands and truck drivers herd about 400 leggy calves onto trucks as the sun crests on the outskirts of this border city. After spending their first eight months on the ranches of Gildardo Lopez Hinojosa, the calves are about to cross the border – bound for Texas and U.S. feed lots beyond. On one of the three bridges connecting Reynosa with Texas, they might cross paths with the beef and chicken shipments that Lopez imports from the U.S. for his local chains of butcher shops and fried chicken restaurants. He gets the best price for his calves in the U.S., and it’s cheaper for him to import U.S. chicken than ship Mexican chicken from the country’s interior. The reality is far more complicated, especially at the border where communities are enmeshed in a shared economy that can be affected by actions or words in either country. Maquiladoras, as Mexican assembly plants are known, get most of the attention. 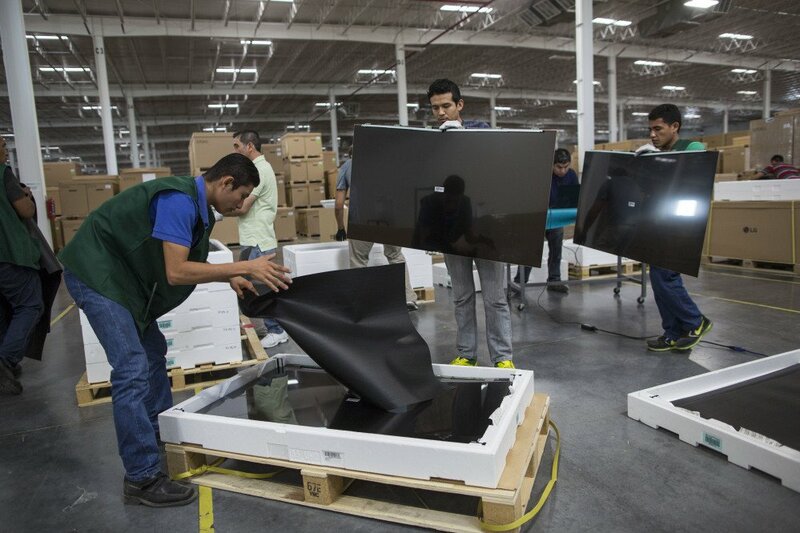 They churn out everything from flat-screen televisions and washing machines to auto components that might cross borders a dozen times before a car comes off the assembly line in Michigan. But U.S. border retailers – downtown discount stores and high-end outlet shopping and malls – also depend on Mexican shoppers, especially those whose jobs in Mexican border cities allow them to shop in the U.S.
For nearly 25 years, Lopez has been sending cows to the U.S. and importing beef to Mexico. Three days a week he loads four to six trailers with his young cows and sends them across the bridge connecting to Pharr, Texas. Once cleared by USDA veterinarians there, buyers from elsewhere in Texas, Arizona or even up toward the Canadian border pick up their cows. After that initial sale, Lopez does not know where they go. In theory, some could come back to him mixed in among the 25 tons of beef he imports from the U.S. every week for his butcher shops. He buys from the big beef processors like IBP, National Beef and Supreme Beef, wherever he finds the best price. Lopez’s calves create jobs in U.S. feed lots and slaughterhouses and the cheaper U.S. chicken he buys allows him to employ more Mexicans in his restaurants. Among his various businesses he employs about 400 people. Nearly 5 million U.S. jobs depend on trade between the two countries, according to a study released last fall by the non-partisan Wilson Center Mexico Institute, based in Washington, D.C.
“The United States depends on Mexico as much as Mexico depends on the United States,” Lopez said. Monica Weisberg-Stewart, across the border in McAllen, Texas, knows that as well as anyone. Her family ran discount stores on the border for more than 60 years, before making the business decision a couple years ago to close. Now Weisberg-Stewart leases their properties to other businesses. The border economy is so interconnected that moves in either country can have dire consequences. As an example, she recalled when the U.S. began requiring a new, more expensive visa for Mexicans who crossed to U.S. border cities. Border residents on both sides say that is already happening. A weaker Mexican peso has been a principal factor, but the unwelcoming rhetoric and fear of the sort of reception they will receive has been another. Several hundred miles upriver from Reynosa, Lidia Gonzalez sat in the shade of El Porvenir, Mexico’s town square, selling used clothing purchased in El Paso. But she was anxious because her supplier had cut back her buying trips recently. She said Mexican customs officials suddenly began hassling the buyer about her purchases, something Gonzalez attributed to the generally deteriorating relations between the two countries. Gonzalez has a visa that allows her to cross, but the last time she felt U.S. immigration agents were interrogating her more than usual. For now she has stopped crossing out of fear they might take her visa. Just west of El Paso, Marisela Sandoval, 39, of Sunland Park, New Mexico, said she has seen fewer border crossers like Gonzalez at her job with Wal-Mart. Consequently, sales at the store have dropped this year, she said. The weaker Mexican peso put an end to Gilberto Lozoya’s shopping trips to Laredo, Texas. Lozoya, 24, has spent four years working in maquiladoras in Nuevo Laredo, a major trade thoroughfare to the United States. He now works as an engineer supporting assembly lines producing gas valves, thermostats and other products so they keep running, but he’s ambitious and hopes to advance. At night he studies English because it would help him move up the ladder at so many foreign-owned maquiladoras, including the Illinois-headquartered engineering and manufacturing firm Robertshaw, where he works now. Lozoya used to cross to Laredo to buy school supplies that he couldn’t find. But the strong dollar put such purchases out of reach. Many maquila workers making only $50 to $60 for a six-day work week rely on a few hours of daily overtime to make ends meet, he said. If something happened to the maquila jobs, Lozoya said he worries that the unemployed would fill the ranks of the drug cartel that controls Nuevo Laredo. But nothing is clear at the moment, he said.